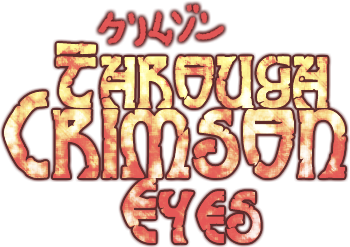 Through Crimson Eyes is the story of a young boy who has the unusual ability to turn his eyes crimson red that allow him to see what lurks in the dark. I'll be writing different episodes of it and will be posting them here and on my official blog whose link you can find in my signature. So feedback is encouraged and criticism is supported. Year 2011, people of Estrife lead a peaceful life. Men went to work, children went to school, everything was fine, except in the shadows. For in the shadows lurked the creatures known as the Unseen. The Unseen targeted humans and ate them which helped them in becoming stronger. The Unseen were creatures which could not be seen with the naked eye despite their huge size, the one who could see them is a 15-year old boy Matt Crimson. Matt has unusual eyes which can turn Crimson Red which allow him to see the Unseen. His father was a well known priest who used to save people from the Unseen but 3 years ago he mysteriously disappeared without a trace. Matt looked into his father's notes and got a clue where his father might be. And the only one who might have known about his father's whereabouts was Shinosuke Takahara, an old friend of Matt's father. Matt went to old man Takahara to question him about his father. Takahara put up a deal that if he would take care of the Unseen lurking in the shadows for him he'll tell him when the time comes and gives Matt a Scythe which he can summon anytime. Later on, Matt is joined by two more people, Katie and Kai with whom he forms the U.E.S. (Unseen Extermination Squad) and steps forward to eradicate the Unseen and find the reason of his father's disappearance. Bio: A mysterious boy who searches for answers to his questions about his missing father. Mr. Takahara who is an old friend of Matt's father hands over Matt a Scythe which he can split into two and transform it into a Sword. He can also join his dual weapons to form a new one. He also uses Necro(Dark) Spells. Bio: Katie is a happy-go lucky girl and is also Matt's childhood friend and his class mate. Katie had an interest in Matt for a long time but Matt never realised that. She helps Matt in saving people from the Unseen and to find his missing father. Bio: Kai lost his parents when he was very young and was then raised by his Uncle. His Uncle taught him the ways of an assassin and then he too passed away when Kai was 15. At first he believes that Matt's father was the one responsible for his parents' death but when he sees Matt's true nature and learns of his past, he decides to help Matt in his mission. "Unngghh.... who's calling my name this early in the morning..."
Girl: "Matt!! Come on already!! It's school tiimme!!!". walking down and goes to the kitchen. Matt's mother: "Oh Matt! You're awake. Good Morn-"
replies Matt to her mother who was about to finish her sentence. Matt nods to what her mother said and leaves the house. forget you..."thinks Matt's mother to herself after seeing off Matt. Just as Matt walks a few steps, he hears a girl shouting at him. walking to his way to school. echoes Katie's voice as she runs after Matt who went ahead of her. enter their class, the girls start whispering. Girl 1: "Look! It's Matt!" Girl 2: "Aah! He's so cool!" looking at Matt with lovey-dovey eyes. Katie: "Tch! Why do they have to be after Matt?" Thinks Katie to herself while she sits down next to Matt. The bell rings, it's home time. Katie: "Hey Matt! Wanna ha-"
Girl: "I... you.... I want you to... read this..."
Matt looks at the letter, then looks at the girl. rejected the girl, Katie follows Matt and asks him upfront. Katie: "Why? Why did you refuse the girl's proposal?" Katie: "Even I.... Even I like-"
Matt suddenly felt a dark presence. Matt hurrily pushed away Katie. Katie fell on the ground. Katie: "Matt!! What did you do that for?!" Matt: "Run! Run away as fast as you can!" Katie: "Huh? M-Matt? What are you-"
turning crimson red. It was as if blood was spreading in his pupil. Matt: "Oh no you don't!" he picked up his bag and went on his way to home. At 9:30 PM, there was a knock on Matt's door. Katie: "Umm.. Matt... it's me, Katie..."
For some reason Katie seemed timid than usual. Matt: "It's open, come in." was besides Matt's study table and said in a low voice. Katie: "Those.... things..... what were they?" Matt: "You don't need to know, it's none of your concern." At hearing that, Matt put down the magazine and sat on his bed. Matt: "You saw me didn't you? I thought I told you to run away." Katie: "I couldn't! I just.... couldn't....."
Katie faced down, almost about to break into tears. Scythe. But you are not to tell anyone of what I am about to tell you." Katie looked up and replied with an okay. Katie became serious at hearing those words. Matt: "Usually, they cannot be seen with the naked eye, only those who possess the "Crimson Eyes", like me can see them." Katie looked a bit confused. Katie: "But then, how was I able to see them?" Matt: " I don't know, but I do know a person who might know. You've got some time, right?" Matt: "Good, we're going outside." At hearing that Katie shook up a bit. Katie: "Eh? B-but aren't those Unseen still outside?" Matt: "Don't worry, I'm with you." Matt's words seemed to have calmed Katie down. Matt stood up and wore his jacket. With that said, they both went outside. It was a chilly weather and Katie was shivering a little. Katie: "W-where are we going?" Matt: "We're going to see an old friend of my father, Mr. Takahara." Katie: "B-b-but what does he has to do with all this?" Matt took off his jacket and put it on Katie. entrance. Matt slided the door and entered, Katie followed her. Matt: "Old man Takahara! Where are you?!" A voice came from the inside replying to Matt's yell. Matt: "I'm here, I'm here! Be there in a minute!" ??? : "Yes yes! I am fin- ouch!" Matt: "He's fine, he does this often." A man nearly of age 50 came out of a room on the right. ??? : "Ow, and I am not old, ya' little twerp!" The man yelled at Matt. Matt: "Oh really?" said Matt with narrow eyes. "Anyways, Katie, this is Mr. Takahara, or just call him Old man Takahara." Mr. Takahara: "I said I'm not ol- Why hello there! What a beautiful young lady!" Katie: "Err... thank you, Mr. Takahara." Mr. Takahara: "My my! What a mannerful young lass!" Matt: "We can do this another time. Old man, I need some help. It's about the Unseen." Mr. Takahara suddenly got a serious expression. Matt: "Don't worry about her, she knows about them. She even saw them earlier tonight." Mr. Takahara said in surprise and then looked carefully at Katie. Mr. Takahara: "Come with me inside you two." Matt and Katie followed his order and silently walked behind him in a room. They sat down on cushions around a table. Mr. Takahara: "Now, Katie was it? Tell me, have you ever experienced something related to occult?" Mr. Takahara: "Anything, perhaps a ghost encounter?" took me home and my parents said I was asleep for 2 days straight." Matt: "Remembered something, old man?" "Possesser". What it said to you were incantations to enter you and take over you. But for some reason, you didn't become affected by it. Tell me, who treated you when you were brought home?" Katie: "My parents said it was Matt's father." Matt became attentive at hearing that. Mr. Takahara: "I had a hunch, that old idiot." Mr. Takahara: "That idiot did however purify you from the Possesser, but he left it's ability inside of you." they can also absorb many other things to power itself, and those were left in you." Katie: "But what does that have to do with me being able to see the Unseen?" Matt: "It's simple. When one has the ability of an Unseen, he or she can see the Unseen as a side-effect from the abilities." Matt: "But one question remains, why wasn't she able to encounter one before?" Mr. Takahara: "Now that Katie's shield has worn off, she can be harmed by the Unseen. And for that, she needs offense." Mr. Takahara stood up and opened a drawer. He took out a book and handed it over to Katie. Katie took the book and opened it. Inside, everything was written about fire spells in detail. Mr. Takahara: "Unlike Matt, you have to memorize these spells. You'll also be needing training. Matt, you know the drill." Matt: "Yeah yeah, come on Katie." Katie: "But where are we going?" Matt: "To the place where you'll be practicing your spells, the Training Dimension." Matt pulled Katie up and dragged her into the backside of the store. Matt opened the door of the store room and went inside. Katie: "THIS is the Training Dimension?!" Matt: "This is the Gate to the Training Dimension." left side and a forest on the right. The whole place freaked Katie out a bit. Matt: "This is the Training Dimension, where I had trained and where you'll be training....."
Meanwhile, in the previous room where everyone was sitting, Mr. Takahara was sitting on the floor with his arms crossed. when he comes for you...."
KaptainJ for suggesting the name "Through Crimson Eyes"
And everyone else who I know and I don't. You can also find TMC and my other works on my blog, bblog0(dot)blogspot(dot)com. That's a great story Basil, I've been checking your blog every now and then for a new chapter. I just want Matt to like, stab peoplez. It was a joke xD, but yeah, I know. Of course I'll make it. Why not? Just PM me about the details again, I sort of forgot it. @_@; School is so evil ..